“Grace and peace be multiplied to you in the knowledge of God and of Jesus our Lord, as His divine power has given to us all things that pertain to life and godliness, through the knowledge of Him who called us by glory and virtue, by which have been given to us exceedingly great and precious promises, that through these you may be partakers of the divine nature, having escaped the corruption that is in the world through lust. But also for this very reason, giving all diligence, add to your faith virtue, to virtue knowledge, to knowledge self-control, to self-control perseverance, to perseverance godliness, to godliness brotherly kindness, and to brotherly kindness love. For if these things are yours and abound, you will be neither barren nor unfruitful in the knowledge of our Lord Jesus Christ. For he who lacks these things is shortsighted, even to blindness, and has forgotten that he was cleansed from his old sins. Therefore, brethren, be even more diligent to make your call and election sure, for if you do these things you will never stumble; for so an entrance will be supplied to you abundantly into the everlasting kingdom of our Lord and Savior Jesus Christ”. (2 Peter 1:2‭-‬11 NKJV). “Therefore do not worry, saying, ‘What shall we eat?’ or ‘What shall we drink?’ or ‘What shall we wear?’ For after all these things the Gentiles seek. For your heavenly Father knows that you need all these things. But seek first the kingdom of God and His righteousness, and all these things shall be added to you. Therefore do not worry about tomorrow, for tomorrow will worry about its own things. Sufficient for the day is its own trouble”. (Matthew 6:31‭-‬34 NKJV). “And my God shall supply all your need according to His riches in glory by Christ Jesus. Now to our God and Father be glory forever and ever. Amen”. (Philippians 4:19‭-‬20 NKJV). God gives us everything to enjoy,not to worship. But this I say, He which sows sparingly shall reap also sparingly; and he which sows bountifully shall reap also bountifully. Every man according as he purposes in his heart, so let him give; not grudgingly, or of necessity: for God loves a cheerful giver. 1. You determine the amount you receive by the amount you sow. 2. Your attitude of giving must be cheerful and not a painful, hurtful, or sad attitude. 3. God loves a cheerful giver. This kind of giving is well pleasing unto to Lord. •You cannot beat God’s giving no matter how hard you try. The more you give the more He gives back to you. 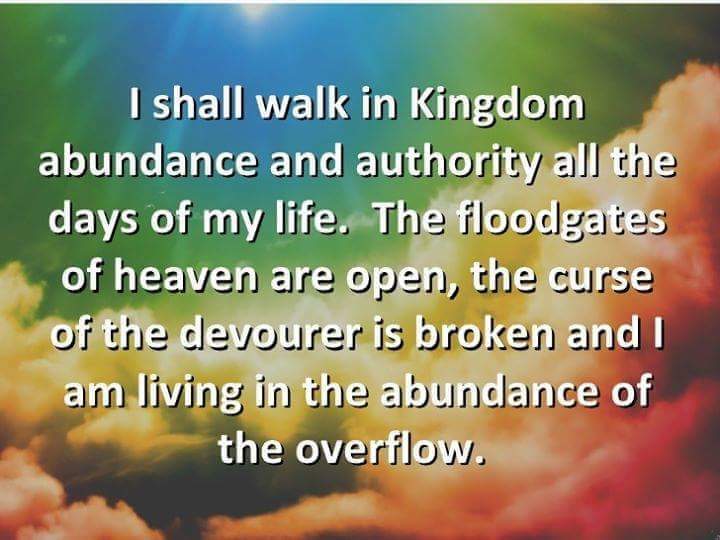 This entry was posted in Daily Message and tagged God wants us to live abundantly, Godly blessings.